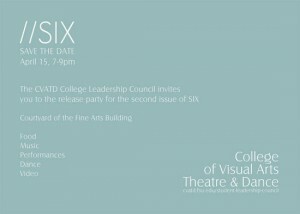 The CFA Student Leadership Council invites you to the release party for the second issue of SIX on Sunday, April 15, 2012, 7-9 pm in the FSU Fine Arts Building Courtyard. In addition to giving out copies of SIX 2012, the evening will feature performances and video from students, Mediterranean food, and live music. The event is open to the public. Come celebrate the end of the year with us and honor your fellow artists & students in person as the new edition of SIX is released.